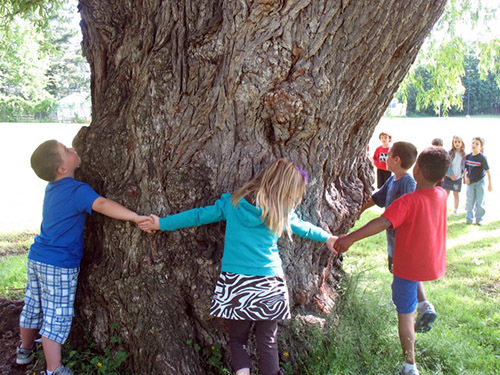 Interactions with nature and green space have lasting impacts on learning. Kindergarten students at Hillside Elementary School in Niskayuna, New York, put this theory into action when they worked with fifth-graders to complete a nature trail that stretches four-tenths of a mile along the perimeter of their school’s property. Initially, kindergarten teacher Christine Mathews thought to have her students create a map of a trail as part of their lessons. Mathews, along with fifth-grade teacher Christine O’Reilly and librarian Debbie Urbriaco, wanted to provide outdoor learning opportunities for their students and a walking trail for residents who live near the school property. The idea soon evolved into a collaboration between classrooms, and a more hands-on and involved project that engaged students with their community to build their own trail. They researched nature trail designs and grant opportunities. 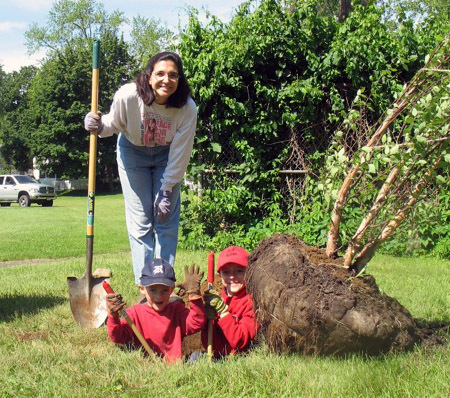 One of the grants they applied for, and received, was a Project Learning Tree (PLT) GreenWorks! service-learning grant. As a prerequisite for the grant, Mathews attended a PLT workshop to learn how to use the environment and the outdoors to engage students in learning. Fifth-graders class joined with the kindergarteners in planning the trail, serving as mentors to their younger counterparts. Together, they designed a logo, created a map and a guide, and researched plants to place along the pathways. A parent volunteer who is a professional landscaper and the school’s head custodian helped the students design the trail. Students, parents, and other volunteers spent several weekends on the project, and about 75 people participated on the final day of work that included planting trees and a butterfly garden. When complete, Hillside held a nature trail dedication ceremony to recognize the contributors and celebrate their accomplishment. I was invited to give the keynote address and told the audience that the trail represents a symbol of service, of community, and a dedication to getting students outdoors and getting them to experience everything that nature has to offer. After the formal program, students from the kindergarten and the fifth grade led the rest of the school in walking the trail, and local press covered the event. The positive connection between nature, education, and community was clear. Throughout the process, the students took skills learned in the classroom and applied them to cooperatively improve their environment. The town’s residents also benefited from working with young people to beautify their surroundings to creating a place for them to also experience nature and learn from the things we can find in our backyards. Pairing older and younger students provides learning experiences for them both. Even before we wrote grants or had approval for constructing a nature trail, we were committed to establishing a strong relationship with our classes and finding ways for the older children to mentor the younger ones. Based on classroom observation, teachers paired students according to strengths and needs. However, the relationships take time to develop, and doing specific activities together, such as our friendship books, really helps. To involve other grades or classes, make it as easy for them as possible. For example, provide some funding or suggest specific options they can choose to do, such as the butterfly garden created by the school’s third-graders. Get support from the principal. Our principal believed in us teachers and in the project. She encouraged us to take risks. Children learn best by seeing and doing. We organized weekend or after-school hikes to see other nature trails nearby. Parents were involved by bringing their children to the events and stayed to participate. As a community of learners, our students took pictures and recorded their observations to show and discuss what they had seen with those who could not attend. Ask parents for help. Students, their parents and families were invited to participate in the construction day. We organized people into small groups based on the interests they indicated on a RSVP form (laying ground cover, posting signs, planting trees, etc.) and assigned a parent to be “team leader” for each group. In addition to our parent who was a landscaper, another parent was a carpenter who could help with the signage. A parent who could not participate in the construction was more than willing to organize the refreshments. Teach kids about trade-offs and future action. They could not accomplish all they would have liked, but they learned to prioritize. They are now seeking funding for benches and other features. Ask local businesses for donations. Many businesses are willing to donate and sometimes all it takes is a letter from your students explaining why their project is worthwhile. Tom is a former New York PLT State Coordinator and works for the New York Department of Environmental Conservation. From Landfill Larry to an “idle-free” pick-up zone, students at Dimensions of Learning Academy found innovative ways to make a difference.